Most churches have back-up vocals for their song services. However, the singers may not minister nor enjoy as much as they could because they do not sing in parts. With the exception of one or two talented ones,most struggle with pitch and timing. This is the case across the board. After all we are not trained singers. A majority do not read music or are illiterate in music. How nice it would be to sing with musical harmony, musical statements and spontaneous improvisation to enhance the spiritual message. Due to this lack, we have set out to teach this course. We want to empower and educate your singers Imagine having a group of singers who can sing from music scores without having to spend hours teaching them their parts! Imagine them harmonizing by ear! All this is now possible with MUSIC EDUCATION FOR SINGERS Level 1-4. It’s only a matter of training and practice. » An iPhone or Android Smartphone with earphone. Part Singing: Hymn singing in the key of C,F&G. Singing soprano, alto, tenor & bass parts. If group is big enough 2-4 parts singing simultaneously. Timothy Lee is a producer, music arranger, sound consultant, and educator. He has been involved in the local Christian and music industry for more than 20 years. In the 90’s, he had the privilege to work with celebrities like Michael Wong (Malaysia Goodwill Tourism Representative to China), Fauziah Latiff (Malaysian Idol Judge), Francesca Peters (singer of Setia on RTM), Hetty Koes Endang (Indonesian Celebrity), Sara Loo, Esther King (former Platter’s) and Gregg Martinez (singer who had stints in Donald Trump’s hotel). His accomplishment in the recording field includes producing the best selling local English gospel album “Everytime I Pray”. He has also produced the winner for Best New Hymn category of the Australian Gospel Award 2004 “Favoured Chick”. He arranged and produced both albums. 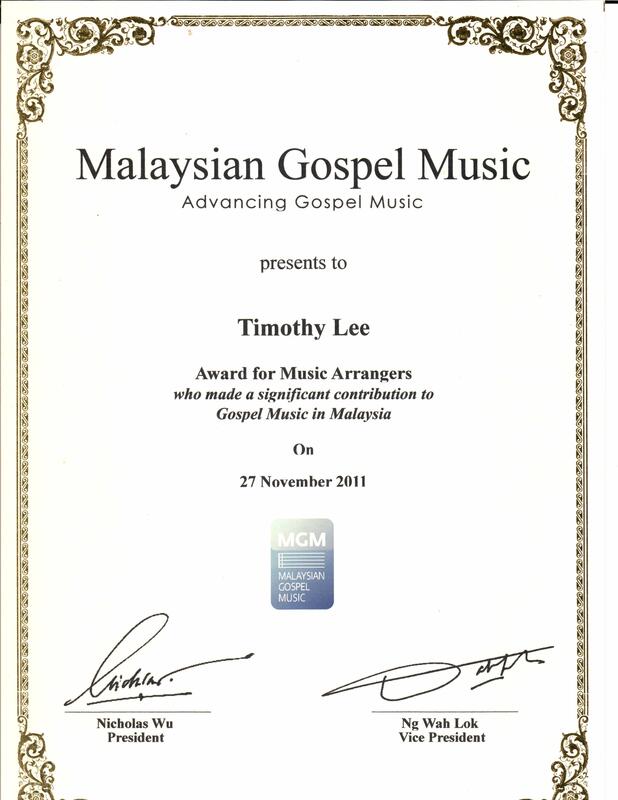 In the year 2011, Timothy has been awarded “Music Arranger” and “Music Producer” who made significant contribution to Malaysian Gospel Music (MGM) . His career in the local entertainment industry started with the Jazz band “Free Flight”. (1989 – 1990). From 1990 to 1992 he was playing keyboards for the band Memories. He was also in a Christian band backing international gospel artist Bob Fitts for the Arise and Shine 1990 concert. He was also in the band that was the opening act for Sound Praise 1996 Concert featuring world class musicians; Abraham Laboriel and Alex Acuna. In 1992 he left the entertainment industry to join Asia Pacific Music Sdn Bhd as an in house music arranger. He was involved in the recording and production of local Chinese singers. In Asia Pacific Music, he worked under Mr. Lee Choon Siong (not related), a renowned Chinese composer for the late Teresa Tang. It is here that he honed his skills for studio work and producing albums. 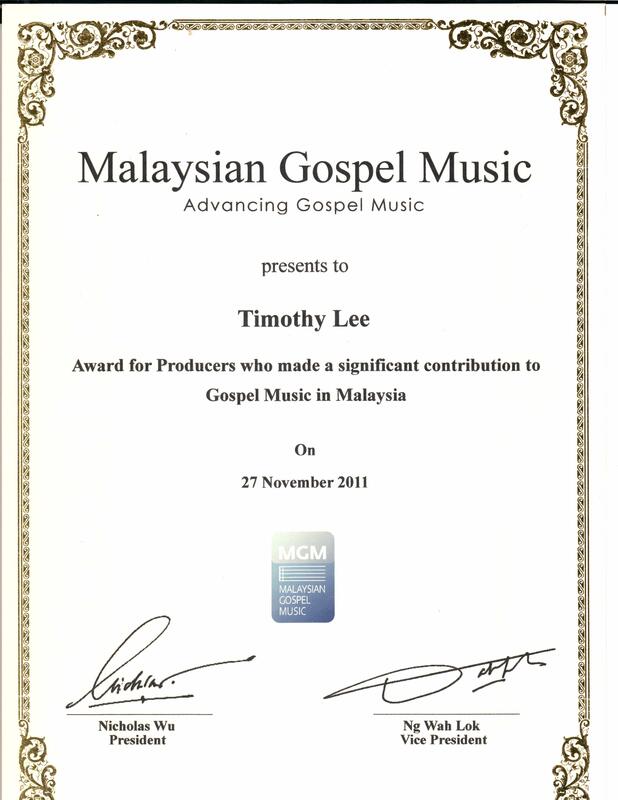 From 1991 to 1993, Timothy was also involved as a freelance music arranger with Chenaniah Sdn Bhd, a Christian recording studio. He was involved in the albums “Suen” series, James Yee, Aris Siew “Fire to Gold”, HT Long (Malaysian Elvis), Esther King (Love is the Key), Christine Holmes, and many other Christian artists. 1. Design, supply & install pro audio sound systems, stage lightings and projector systems. 2. Music training at church levels for instruments, sound engineering, jazz harmony, singing in parts and ensemble. In 2000 he built GSUS studio and recorded a string of English albums as well as the popular Indian gospel album series “Anbin Aradhanai” (all volumes except volume 5). His latest endeavour is Aris Siew’s Make Me Strong (2010) and Karen Tan’s Step Into The Light (2011) . Timothy has also been a keyboardist for international events like the Global Leadership Summit 2008 – 2011 and recently the World Pentecostal Conference 2013 at Calvary Convention Centre. 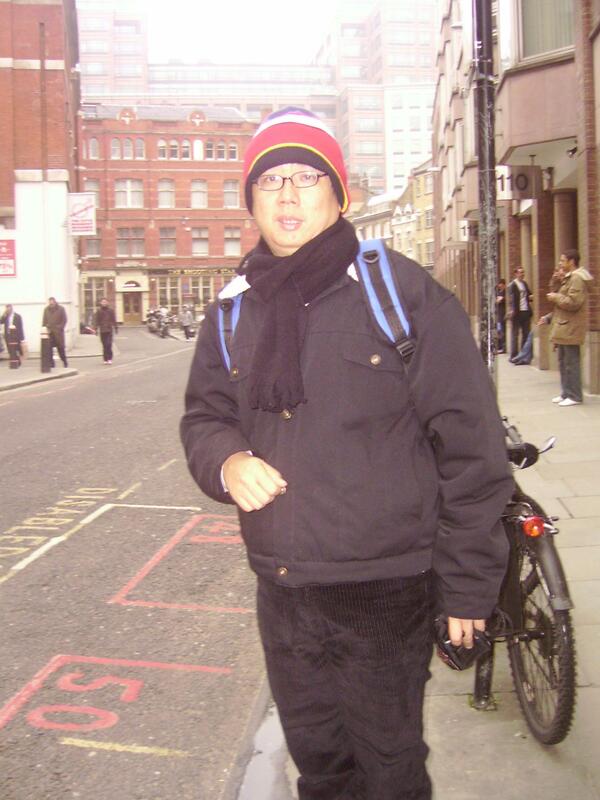 Timothy has studied at Hammond Music School and International College of Music (ICOM). He was also the music director for Praise City Church (1993-1995, 2010 – present) and KL Glory Praise Christian Fellowship (1999-2000). Aspiring songwriters, lyricists and musicians. Those who need help shaping their songs. Timothy Lee is a producer, music arranger, sound consultant, and educator. He has been involved in the local Christian and music industry for more than 16 years. In the 90’s, he had the privilege to work with celebrities like Michael Wong (Malaysia Goodwill Tourism Representative to China), Fauziah Latiff (Malaysian Idol Judge), Francesca Peters (singer of Setia on RTM), Hetty Koes Endang (Indonesian Celebrity), Sara Loo, Esther King (former Platter’s) and Gregg Martinez (singer who had stints in Donald Trump’s hotel). First 20 participants are entitled to a free CD. How Can A PA System Sound Great & Be Free From Noise? A PA System can sound good if it has been designed, installed & tuned well. It also has to be operated by competent PA personnel as well as stage performers. The system should also have periodic maintenance & faulty parts replaced to be at optimum performance. Scroll through the list below and see if you have these issues. You can’t hear the singer/preacher consonants. Words become ambiguos. Grace sounds like Gray? does your microphones sound bright and metallic? or maybe it sounds the opposite dull and unclear? Sound is uneven in volume or tone from section to section. Various PA Personnel hears things differently? Sound every week fluctuates in quality? PA personnel not alert nor prepared. Slow to switch on the microphone? Abrupt cut to music from video clips? Sound causes distraction. It could be sound changing in real time as the service is going on. It could be one particular instrument is too loud. The list is non technical & non exhaustive. The issues are common and can be easily overcome. You may have other issues and we would be glad to help you solve them. Complete the form below and we will put you in our mailing list. You will receive information about Music Ministry related topics.